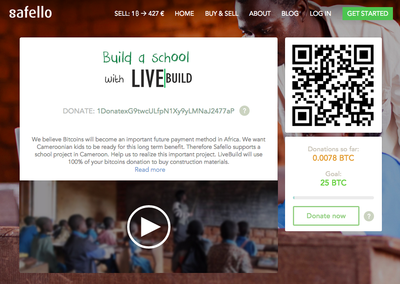 "The donation pages of Livebuild, Shifo and the Lifeboat Foundation show the power of Bitcoin in a very tangible way. Real-time incoming donations from people all around the world uniting to complete a funding goal to support these causes. It's an incredible thing to watch." The company kickstarts the pages as an experiment to see how quickly the funding goals are reached. Its service is now in beta and interested parties can sign up for early access via https://safello.com/donate. 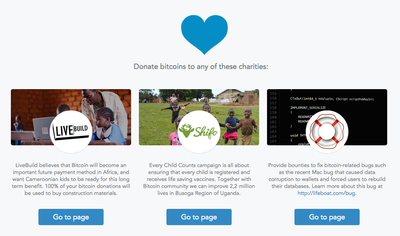 Schuil adds: "Our goal is to make Bitcoin fundraising a fundamental source of income for these and other charities by connecting them to audiences they may otherwise not reach. The variety in campaigns show how widely applicable this is and we hope to spark a wave of pages to introduce a new way of donating to the charities we all care about." "I believe Bitcoins will become an important future payment method in Africa. With this project we want Cameroonian kids to be ready for this long term benefit." Campaign description: The community of Ntisaw built their own school in 1990. Sadly, nowadays the school is in a bad shape. The class rooms are small and poorly equipped. The roofs of some of the classrooms are leaking. The community wants to change this situation. They are already collecting building materials and recently two new class rooms were constructed. With our support they will be able to construct an additional 4 class rooms, a library and toilets. "We at Shifo are very excited to collaborate with Safello and join hands with the Bitcoin community. This collaboration will make a difference in the lives of children. 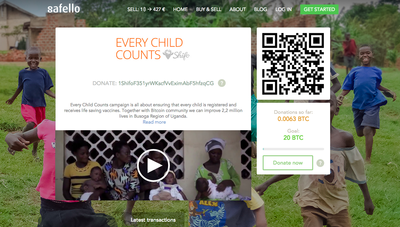 100% of funds raised with Bitcoin community will go to the cause, and for every bitcoin, Shifo will provide impact reports." Description: Vaccines save lives. Yet 1 in 5 children do not have access to the most basic vaccines. As a result, every year 1,5 Million children do not celebrate their fifth birthday. Registering children and making sure they receive life-saving health services is the key to improved child health. Every Child Counts campaign is about improving child health through systematic child registration and vaccination follow-up in Uganda. "We look forward to developing a bounty fund to be used to fix bitcoin-related bugs. 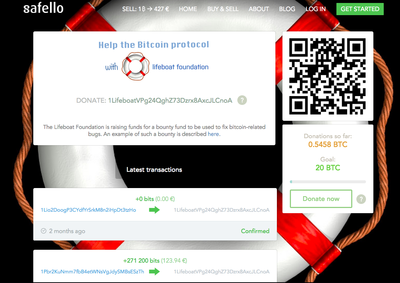 Bitcoin backs our endowment fund and we would like to give back more to the bitcoin community." LiveBuild believes that every human being has the power to improve their life and the lives of others. But without the basics – without clean drinking water, without proper sanitation and without the ability to read and write – this is a huge challenge. Together with the community LiveBuild builds the structures necessary for people to reach their full potential. Within the Netherlands LiveBuild is a community of driven, creative young people that loves to organize events and festivals in order to generate funds to support Cameroonian communities. Shifo is a non-profit NGO with a mission to improve child health worldwide by strengthening health service delivery in underserved areas. Shifo has developed models and the information and support system 'MyChild' to tackling the major challenges in reaching every child with life saving preventive health services. Shifo was launched in June 2013 by a team from Karolinska Institutet, The Royal Institute of Technology (KTH) and Karolinska University Hospital, Stockholm, Sweden. The team consists of specialists with different backgrounds such as medicine, engineering, public health, development cooperation and interaction design. The team has more than 10 years experience of work within international eHealth projects in low resource settings.